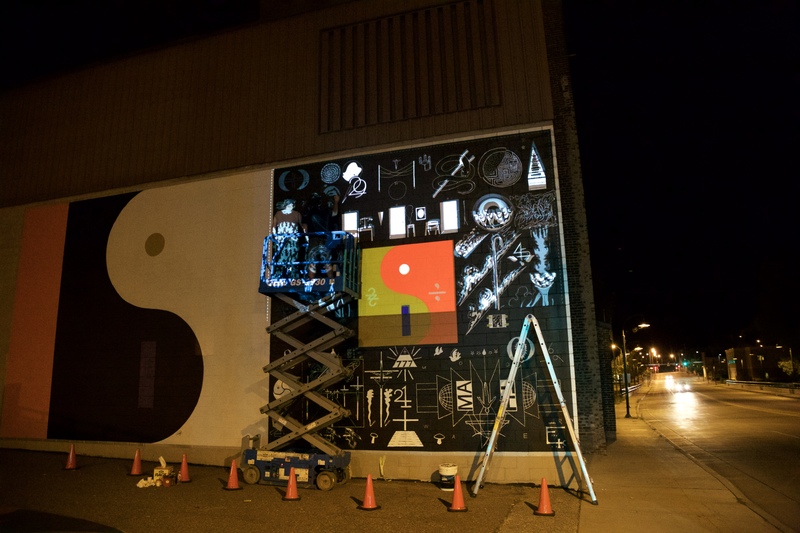 Just before midnight this past Thursday in Eau Claire, Wisconsin, two bearded men silently painted a mural on the side of a brick building on Farwell Street. The streets of this small town, historically known for its lumber mills and rural charm, were otherwise deserted. The image featured a square gold and yellow yin yang and rows of vaguely numerical symbols. “Is this the cover of the new Bon Iver album?” I asked. The hirsute painters said the official story was that the mural was for the performing arts center around the corner, but they put “official story” in air quotes and noted that the mural’s hip pseudo-numerology aesthetic didn’t quite match that of the center’s summer production of The Wizard of Oz. The image was the album cover, of course, because a lot of the symbols were the same as those featured in a 23-second teaser video released by Bon Iver in late July, and because the band is from Eau Claire and had announced earlier in the week that they’d be debuting their new album—their first in five years—in town at Eaux Claires, a festival that frontman Justin Vernon founded last year. Furthermore, any information delivered in air quotes is not to be trusted. At this point, the origin story of Bon Iver’s falsetto-blessed spiritual leader Vernon is as well documented as Captain America’s. In the mid-2000s, a brokenhearted Vernon holed up in his parent’s cabin in northern Wisconsin and spent the winter recording what would become his 2007 debut, For Emma, Forever Ago. The reception of the record was unexpected—its elegantly simple approach to songwriting resonating to an emotional core with listeners. Songs like “Skinny Love” and “Wolves” became anthems for heartbreak and frustration, and cemented Vernon as a messenger for frustrating feelings that are so difficulty expressed. The effort—combined with its origin story that, at this point, is almost folklore—made him an indie folk hero. Many people, myself included, still tear up when that album’s title track comes on the radio. In a lot of ways, Vernon’s earnestness was so sincere that it transcended any sort of judgment that might normally come with music that’s so precious and delicate. Vernon’s music appealed to not only critical listeners, but broke into the mainstream—and he found his way to the ear of Kanye West, contributing to Ye’s 2010 record My Beautiful Dark Twisted Fantasy, which launched him into the pop culture lexicon. He’d even eventually get impersonated by Justin Timberlake on Saturday Night Live, a benchmark of modern celebrity. Bon Iver would go on to release another record—this time self-titled—in 2011 that would get Vernon a Grammy for Best New Artist in 2012. Then, for about five years, Vernon was somewhat silent—only contributing to a few side projects and guest vocal tracks for Kanye. Yesterday’s caveat was the rain, which arrived as a polite sprinkle around 4 PM and then refused to let up for more than four hours—leaving much of the audience damp, beer-buzzed, and a bit stanky. While most of the flip-flopped Midwesterners held it together through the weather, the rain, in conjunction with a lot of mellow AF music, kept the collective energy level at a low simmer well into the evening. So, yes, vague numerology is literally what this record is, which itself is also called 22, A Million. Throughout the hour and 20 minute set, Bon Iver displayed the same impassioned intensity that has defined much of the band’s catalog, while also revealing a newly digitalized sound to match all those numbers. “10 d E A T h b R E a s T ⚄ ⚄” was an crunchy, percussion driven march building slowly with Vernon pleading “goddamn turn around now,” while “715 - CR∑∑KS” featured the same delicately auto-tuned Vernon vocals made famous when Kanye used them to excellent effect on “Lost In the World.” The set continued on with “29 #Strafford APTS” an all-analog, lightly country soft ballad that was among the loveliest and most falsetto-lead in the new batch of music. Vernon’s vocal range remains a force, and a key characteristic of the Bon Iver output. While a folksy reputation might precede the group, Bon Iver has always been a band that’s far more robust and raucous live than their albums might suggest. As such, it’s impossible to predict exactly what all of these new songs will sound like when the album is released on via Jagjaguwar on September 30. (Vinyl pressings of “22 (OVER S∞∞N)” and “10 d E A T h b R E a s T ⚄ ⚄” were available at the festival merch stand, while the same two tracks were released worldwide along with additional album information immediately after the show.) Last night the sound was dually delicate and huge, digital and analog, tense and loving, and altogether made big via an eight person brass section, two drummers, three guitarists (including Vernon), saxophone and loads of digital loops and effects that serve as the primary evolution in sound on 22, A Million. "I worry about rain and I worry about lightning," Vernon sang on“00000 Million” the album’s plaintive, soul searching closing track. "I wander out just to come back home." Life is full of decision making—who we date, what we do to make money, who our friends will be—but we have no control over where we are born, a circumstance that defines so much of who we are. As a fellow Wisconsinite, I am certainly biased, but much of 22, A Million seems to be about coming home to the woods again after your world has been utterly and irrevocably changed, whether through loss or love or the bizarre circumstances of fame. It is altogether a stunning, effective addition to the band’s catalog, finding Vernon and friends not resting entirely on old tricks, but not abandoning their signature sound in their journey towards a more electronic future, either. Or maybe, this is just a record about coming home, regardless where that home is. "Humbled and thankful, that's what I say when people ask me how I'm doing,” Vernon said apropos of nothing towards the end of the show. What a special and probably surreal moment it must have been for him to debut his internationally anticipated LP in the woods of his hometown as the headliner of a festival only made possible via his massive success, and how cool that he would do it this way. "I made another short record so I'm playing some old songs too," Vernon noted after finishing the album’s ten tracks. He was then joined onstage by three sister vocal outfit The Staves who sang the guitar part on For Emma’s “Re: Stacks” before a stirringly massive extended version of the crowd-pleasing “Creature Fear.” Vernon then welcomed his obvious influence Hornsby onstage to play piano on the show-closing “Beth/Rest.” The crowd waited around hoping for an encore of more old material that never came, eventually dissipating into the night’s natural chorus of crickets while a waxing gibbous moon glowed through the clouds. “What did you think of Bon Bon?” a large bearded man wearing a red flannel asked me on the bus ride back to the campsites after the show. I told him I thought they sounded tremendous, better than ever, that I had nearly cried despite the obvious impediment of not knowing most of the material they played. Katie Bain’s lucky number has always been 22. She’s on Twitter.